As the Ibibo-run e-commerce portal Tradus.in nears its first anniversary, it continues its steady progress towards becoming a premium online destination and refining its Cloud-based ecosystem that connects suppliers, buyers and logistics players. 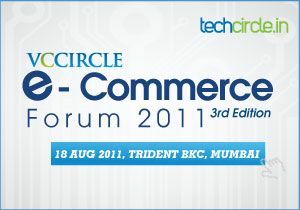 As a precursor to the third edition of VCCircle E-Commerce Forum to be held on August 18, 2011 in Mumbai, Techcircle.in connected with Rahul Sethi, President, E-Commerce at Ibibo Group. Sethi talks about Tradus.in, his e-commerce strategy and plans, key investments for the year and how Amazon's entry may affect the current e-commerce arena. Tell us how Tradus.in has been scaling up. Our strategy is to focus on brands and be a premium online destination. We are more like a mall and a platform. But we have got a slightly different strategy compared to others who source and carry inventories and sell online. So, be it electronics, consumer durables, mobile, cosmetics or perfumes, we are only focused on brands and do not offer sub-standard Chinese mutations. We have 200 brands and around 2.2 million products on the site. The core essence of the company is customer delight and our processes of supply, demand aggregation and fulfilment have been built around customer satisfaction. We get close to 45,000-50,000 unique visitors on a daily basis and more than a million unique visitors per month, according to comScore. Be it transactions, top line sales figures, traffic, new users or buyers, we have been practically doubling every quarter ever since we launched in September, 2010. And this growth has been consistent throughout. Today, we record thousands of transactions per day, with an average ticket size in excess of Rs 1,000. Ticket sizes have softened slightly since we launched when it was around Rs 1,600-Rs 1,800 as our volumes have grown. In May this year, we have had one million users. What is the next milestone you are targeting? We want to cross Rs 100 crore in run rate, which I expect to happen in the next 10-12 months. Our growth rate will flatten out a bit as the base grows, but I expect Tradus to grow better than the industry average. In terms of number of products available on Tradus.in, the idea is to take it up to 10 million SKUs by December, 2011. What is your e-commerce strategy? As we look at it broadly, our strategy towards supply is to create a Cloud-based system and an ecosystem of suppliers which will help us scale. We have built a proprietary technology platform for them where their inventories are directly tracked into our system and orders placed on our platform are directed to them. The platform has buyers, suppliers and six logistics players with whom we have partnered. It automatically routes a request to the concerned supplier and the logistics partner based at the buyer's location. We are trying to create a Cloud-based ecosystem. We go via the brands and we do not undercut; we go with the brands and associate with authorised suppliers. Generally, we tie up with category experts â€“ say L'OrÃ©al â€“ who already have a supply chain ready and we leverage the same to get their suppliers onto our system. Our role is to extract the demand from the Internet and advertise for suppliers. We ensure highly efficient demand aggregation and create a seamless experience for sellers, so that all they need to do is to come up with the inventory. And with our fulfilment system, we have partnerships with logistics providers who deliver to 5,000 pin codes, across 350 cities. It covers 85 per cent of the Internet population in the country. As of now, there are 4-5 per cent of demands from certain cities which we cannot capture because we do not have our delivery system there and we are looking to solve this. What are the top brands you have partnered with? In consumer electronics, we have signed up with Canon and Nokia, for LCD TVs â€“ Samsung, LG and Toshiba, and for notebooks â€“ Sony Vaio, HP, etc. In fashion, we have Adidas and Nike, as well as designer labels. Cosmetics brands such as L'OrÃ©al, Davidoff, Gucci and Bvlgari are also available on Tradus. We have around 200 vendors now and we get suppliers from outside India too. What are the key areas of investment planned for the year? We want to focus on technology and further refine our platform. We will also invest in marketing, demand aggregation. We are now aggressively focusing on creating more efficiency, compared to our competition. We are also investing in referrals and social media, such as Google and Facebook, as well as user incentivisation programmes. As online marketing and advertising are the highest priorities for Internet firms, can you tell us about your advertising budget and plans? Today, we spend anywhere between $150,000 and $200,000 per month and we are working towards increasing this. But our spend is still on the lower side, compared to the competition, and this is deliberate. It is easy to grow the front end, but we have to scale up the backend simultaneously and must keep it in mind. However, we will have a big bang, a multi-million dollar TV campaign around this Diwali. Since Tradus is a part of the larger Internet group Ibibo, how does it help? As a part of Ibibo, there are synergies which we can leverage. They have strong technology expertise built over the last few years in developing recommendation engines, some of which are easily portable onto shopping. So, we have taken their trend recommendations for social activity and it is helping us grow referrals and the social graph. 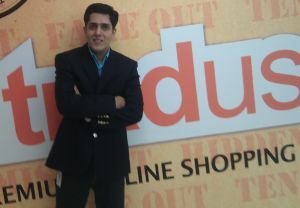 Also, Ashish Kashyap, the group CEO, has extensive experience in e-commerce in India, which has given us direction. How is your classifieds portal TradusAds faring? Tell us about some key trends on the site. Since its launch in April this year, TradusAds has seen one lakh listings. And we sell a whole range of products â€“ right from buffaloes to swanky cars like the Mercedes. With TradusAds, our category approach has been consumer-to-consumer (C2C) trading and localisation. It is a hyper local effort and within localities, you will see various colonies, sectors, etc. Consumers are open to trading within communities because chances of conversion are high and rates are often better than the industry average. We are actively dissuading business users from listing, as they create redundant listings. It is difficult to rule them out entirely, but we have oriented our products and worked out a strategy to make it difficult for them to list. For example, we do not focus on real estate and jobs, which are top B2C categories. Instead, we look at household goods, which witness consumer trading. Classifieds as a concept is more inclusive and I believe it will take off first in developing markets like India where liquidity, per capita GDP and cash in wallet are lower. Currently, classifieds comprises 75 per cent of the e-commerce market. What do you think of the e-commerce ecosystem in India? How will Amazon's entry affect the current market? The honeymoon period is over and it is really very interesting right now. There is a big upswing with a lot of investments in this category and most of the players are well capitalised. But we may see a drastic change post Amazon's entry. There is an 'Amazonisation' of e-commerce happening in India and players will have to reorient their strategies soon. Value propositions will have to come out strongly, because it will be tough for many to compete with them in horizontal space. Only the players who are able to create a differentiation will make it while others will perish. In fact, we have already seen some amount of verticalisation happening. And how will start-ups face this situation? Considering the current landscape, it is still in the initial stages and it's really tough to differentiate men from boys. Funding is not difficult, because $3-$4 million is not a big value for investors. Also, it's a good hedge because India is an important and strategic story for these big players and they don't want to miss out on the e-commerce boom. Therefore, a series A round is very easy to get and a lot of people have been able to raise one. However, many of them are greenhorns, 20-somethings who are passionate and have the fire in their bellies. So, everything depends on how well they are able to execute, deploy the funds and get the talent pool organised to get the vision going. We will see a massive filtering happen in the next 12-18 months and the existing larger players will verticalise quickly.